Destroy their crew or sink their galleon to win. Pick your color and roll dice. Higher roll goes first. Place your pirates on your ship and matching damage cube on your ship's damage counter. Shuffle and deal 5 cards face-down to each player. On your turn discard and draw up to 2 cards, if desired. Play a matching pair, if possible and if you want to, or your turn is over. To play a matching pair—roll the dice. If total matches any of the card's bottom numbers, it wins! If not, your turn is over. Knife/Pistol/Bomb/Cannon - Take an opponent's pirate and place it beside your ship as a lost pirate. Count cannon hits with damage cube. Four hits sinks ship and you lose the game. Desertion - An opponent's pirate becomes one of your crew. Davy Jones' Locker - Raise any lost pirate and place on your ship. If you played a pair, win or lose, draw 2 replacement cards. Doubloons are wild and can be used to complete a pair. First one to lose all their crew places the Pirate Ghost on their ship and discards 2 cards. Pirate Ghost always plays with only 3 cards (or 4 cards with the gold). Pirate Ghost is always the last to be lost if you gain back any crew. Losing the Pirate Ghost loses the game. Cutpurse variant by OrangeDroogie - If your foe has the treasure and you roll doubles, rather than drawing the extra card from the face-down pile, take it from your opponent's hand—these be wicked ways! Each pirate on your ship is 2 victory points, lost pirates you've claimed are 1 victory point each, and gold is 1 point. Kill or sink your enemies, steal or retain the gold, and be the last Captain standing—be it Pirate or Ghost! The Ghost Captain hates the living equally and wants to make all living-kind suffer for as long as possible—to begin he will randomly fire upon either of the Pirate ships. However, once one of the rival ships weakens or a crew member is killed (by the hand of the Ghost or other Pirate Captain) the Ghost Captain targets the strongest Pirate Captain. The strongest is determined by the number of surviving crew, if tied then by ship health, if tied again then the Pirate Captains are equal and Random Firing commences or will recontinue. Sink the Ghost Captain first to inherit the gold and then try to take out the other Pirate Captain (either their ship or crew). Take out your rival Pirate Captain first and then face the Ghost Captain alone. The second option is risky as when you are the strongest or only surviging player the Ghost Captain will always target you, and you alone. Of course, if you spend all your time destroying the other Pirate Captain then you will have to face the Ghost Captain with likely a damaged ship or reduced crew. You might want to strike up an alliance with the other Pirate Captain to weaken or destroy the Ghost ship but know that alliances can be very self serving and there can be only one winner! It's recommended to play without the Advanced Rules for a few games if this is your first playthrough—once you get the hang of the game you can choose to implement Advanced Rules, at your own risk . . . Note: Matt's versions need an additional pirate ship. You can draw your own or grab the Print and Play zip. If you only want the single PnP sheet with the ship (and instructions) then grab the US Letter or International A4 PDF. Players play as normal (five-card hand, discard and draw up to two cards at the start of their turn, play pairs to attack). Players must announce who they're targeting before they roll. Cannons and hand mortars (bombs) are the only effective weapons against the Ghost Ship; knives and pistols have no effect as they cannot hit the Ghost Captain. You must sink the ship to defeat the Ghost Captain and steal the treasure. All weapons affect other player ships and crews (as per the original rules) except bombs, which only affect the crew and not the ship. 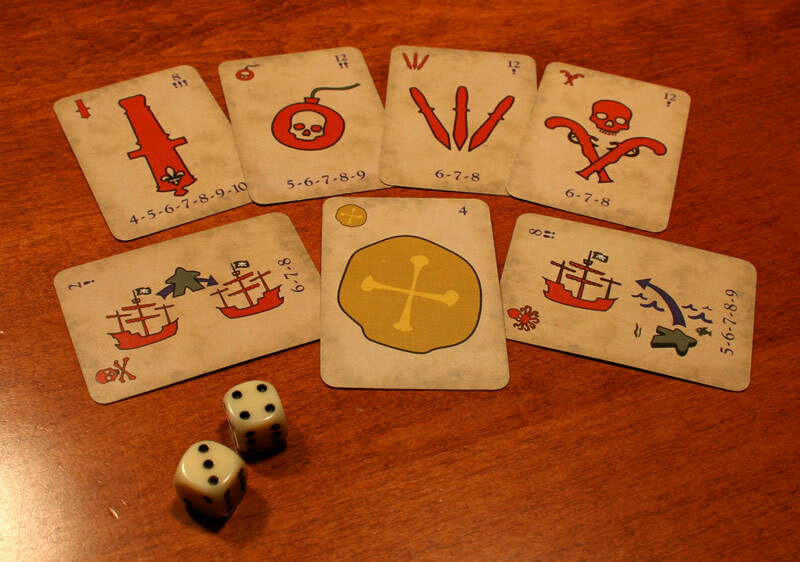 If or when a player is sunk or all crew have perished, all cards in that players hand are discarded from the game. Dice doubles have no effect on the gold (as per the original rules) which remains on the Ghost ship until sunk, at which point it is transferred to the ship of the Captain that sunk the Ghost ship. This signals a win if there's no other Pirate Captain alive. The first defeated Pirate Captain takes on the role of the Ghost Captain (assuming not already sunk)—a highly recommended rule to play! At the start of their turn, a player can recover a single overboard crew member, but at a cost of one ship damage. The player then continues his/her turn as normal. Players may play two doubloons to increase their hand limit from 5 to 6 for the rest of the game. Doubloons spent in this way are lost at sea and removed from the game. Each player may do this only once per game only (meaning the maximum hand limit is six cards). The Ghost Captain has no cards and on their turn a single card is drawn from the draw pile and played as if it is a pair of cards. The Ghost Captain refuses to share and will not take on any shipmates when drawing a Davy Jones Locker or Desertion card. When drawing either of these cards they are lost at sea (removed from the game) and the Ghost Captain's turn ends. The gold cube serves as the health marker for the Ghost Captain's ship. The Ghost Ship targets the strongest player (or sole surviving player). The strongest player is determined by ship health and then living crew members. If tied then Random Firing continues until at the start of the Ghost Captain's next turn until one ship or crew is weaker. On the Ghost Captain's turn, if both Pirate Captains have an equal number of surviving crew and ship health, then chance chooses for the Ghost Captain. Each Pirate Captain roles a single die, the lowest score loses and the Ghost Captains continue their turn with that Pirate Captain as their target. Random Fire is interrupted only if one Pirate Captain has more crew or ship health, or if one Pirate Captain ship is sunk or crew wiped out. If the Ghost Captain draws a doubloon card then the Ghost Ship's health increases one point (to the max four). There's no limit to how many times this can happen so beware! Doubloons spent in this way are lost at sea (removed from the game). Same as above but a third player controls is the Ghost Captain. Pirate Captain players do not inherit this position once they're sunk: When any player is sunk, or crew is killed, they're out! If the Ghost Ship is sunk, the gold transfers to the ship of the player that delivered the final blow. If the Ghost Captain draws a Davy Jones' Locker or desertion card, they put that card in the discard pile (not lost from the game), then draw two new cards, and the Ghost Captain chooses which to play or resolve. Mix any, or use all, of these suggestions to make longer games. Each pirate can be injured once and continue to fight. This requires reshuffling discarded cards at least once. Successful Knife/Pistol/Bomb attacks lay down an opponent's standing pirate first until all are laying down. Once all the opponent's pirates are laying down, subsequent successful attacks take an opponent's lying down pirate and place it beside your ship as a lost pirate. Desertion - If all opponent's pirates are standing, take one and place as part of your crew. If any are laying down, you must take them first. Davy Jones' Locker - Raise a completely lost pirate and place them on your ship. You cannot take an injured pirate. When playing an attack, only show your cards if the attack is successful and then discard face-down (reduces card counting). Cannon attacks only damage the ship—they don't injure or claim pirates. Use the gold to do a cannon damage repair. Throw the gold back into the sea, don't use an extra card, and to gain the favour of sea demons proclaim "Ye cursed demons of the depths, this treasure and our souls to ye so that we may rid the seas of our scurvy foes." Then slide your damage indicator back. You can decide to do this only once each game or an unlimited number of times. Improve your chances with three of a kind. Decide if this should apply to all cards, to attack cards, or to hand weapons only (not cannons). Extend the successful rolls by one each way. For example, a knife and pistol was dice roll of a 6 to an 8 but is now a roll of 5 to 9, hand mortars (bombs) were 5 to 9 and now are 4 to 10. This forces harder decisions on hand management. 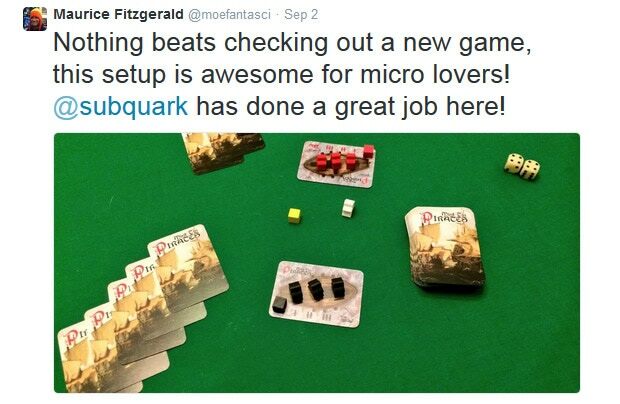 A fantastic single player version that plays very well. Awesome PocketMod version by Nate Johnson. PocketMod folding instructions. 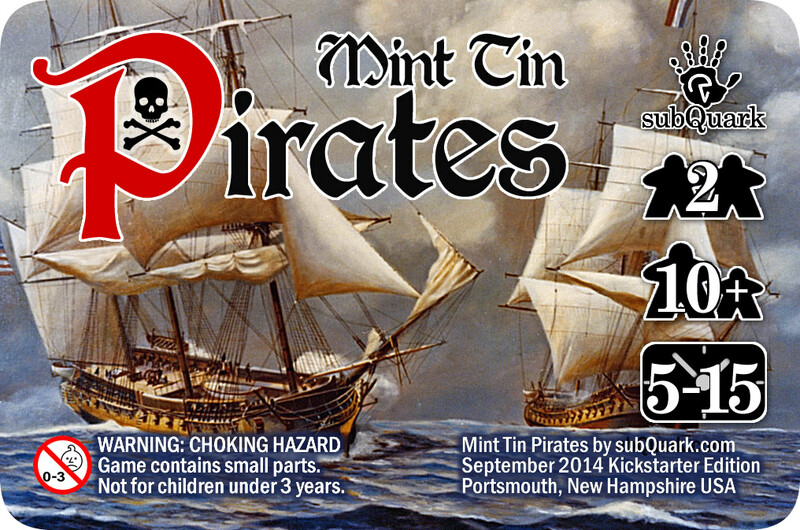 We found that if you take two copies (or three for a six player game) of Mint Tin Pirates, shuffle the decks together, and use these simple rule modifications you can have a four player game that is just as quick, but even more cutthroat than the original. The rules of Play are exactly the same as the base game except that you must declare who you are attacking before cards are played. All dead pirates go to the center of the play area. Alliances are allowed and encouraged, breaking alliances is encouraged even more. The Pirate Ghost is removed from play in a multi-player game, no second chances. You live by the sword or you die by the sword. 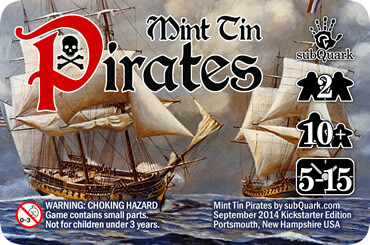 Here's a fantastic long-playing privateer mashup of Mint Tin Pirates and Mini Mint Tin Skulduggery. Start playing Pirates, but . . . doubles gets you Skulduggled! Instead of getting the treasure—play a game of Skulduggery—using the doubled rolled as the spirit number. It's a game within a game! Complete the entire game of Skulduggery and use the skulls you end with to continue Pirates. Add one crystal skull to your Pirates' crew. And then, if you become the Pirate Ghost, add that number of bonus cards to your hand for that turn. After that turn, discard the extra cards, skulls, and treasure back to the depths from whence they came! Add one crystal skull to your crew. And if you become the Pirate Ghost, the crystal skull counts as crystal crew which can be lost OR used as a doubloon. Once you add a crystal skull to your crew, you can't take it back to use in that game of Skulduggery. In a 2-player Skulduggery game, can you play with the second crystal skull? That's up to you! Repair one damage to your ship. Bribe your opponent and steal their treasure! Draw 2 extra cards for one turn and then discard back to hand limit for the next turn. Add +1/-1 to any card's bottom numbers to increase their chance of success. Use 5 skulls as a doubloon. The winner of Mint Tin Mini Skulduggery gets the treasure to be used as normal. It's as simple as two pirate galleons crossing paths in the high seas. Classic 16th century Spanish galleons as often depicted in pirate movies. But they could be French Corsairs or any ship you like (even steampunk ships). The ships are about 10 yards apart. A warm breeze blows and gentle sea swells are interrupted by an occasional abrupt wave. I think back to when I was 10 and my father had a 32-foot red snapper fishing boat and we'd go out in the Gulf of Mexico off the Louisiana coast. The 1600s saw the first European use of the hand mortar and cast iron bomb (grenade). I think of a hollow cannon ball filled with black powder with a fuse. These weapons weren't sophisticated like modern grenades and their damage could vary greatly. Similar to something used by Wile E. Coyote. I imagine 12-pound cannons on these ships. A ship wouldn’t have many 12-pound cannons because of the tremendous weight of the cannon balls and the cannon itself; this was an important factor for sailing speed. Eight-pound cannons were more common. Twelve-pound cannons take more black powder and are slower to load but they pack a huge punch. The flintlock pistols are single shot weapons, and it wasn't uncommon for a pirate to have several of them. I picture a pirate shooting these and handing them to someone hiding below the rails to reload as quickly as possible. That could result in poorly packed shots and maybe even the ball rolling out! 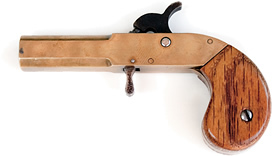 As a young teenager, my dad gave me a .50 caliber percussion cap brass derringer replica (exactly like this photo). He never intended me to actually shoot it but I carved out an oak bullet mold, melted lead tire weights, and made a dozen balls for it! I somehow obtained percussion caps (these came out after flintlocks and work in the same manner), some black powder, and wadding (this holds the powder and ball in place). I shot at an aluminum pie tin and quickly saw how incredibly inaccurate a non-rifled pistol is! Rifling makes a bullet spin as it travels down the barrel and makes it fly straight. Throwing a knife to hit a target isn't so hard, but having the point hit, and not the handle takes lots of practice and some luck. Imagine doing that on a rocking boat with some sea spray and you’d have to be a mega pirate to hit anything! So now you see my perspective on these weapons, which is a combination of research mixed with a little naive experience. 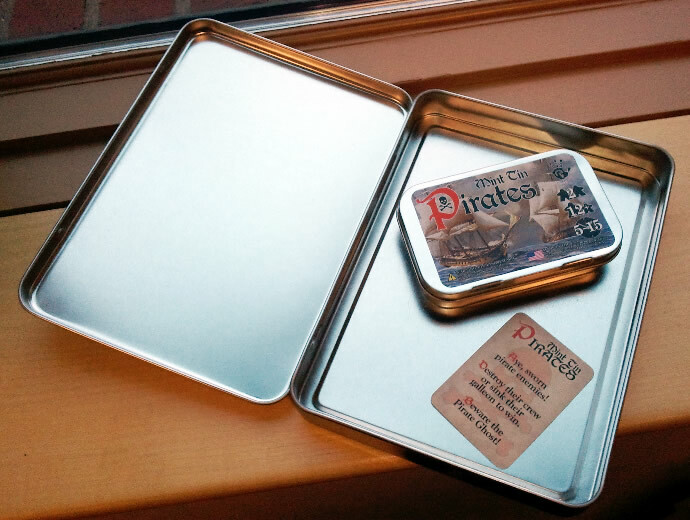 In Mint Tin Pirates, one card represents that you have the weapon and the second card represents it's ready (ready to light for the bombs, loaded for the cannons or guns, and sharp for the knives). The card pair represents a weapon that's ready for use. The dice roll represents the luck inherent to the weapon and the conditions at hand (waves, sea spray, wind). A bomb fuse could fall out, you could miss with your throw, the enemy might kick it away, or they could move out of the way. The cannon could be packed too tightly and blow up, it could miss with the pitch of a wave, or have too little or too much powder, or have wet powder. Naval trivia: The British Royal Navy traditionally sailed with Plymouth Navy Strength Gin (57% versus 41.2%). It's said that even if this gin spilled on gunpowder, the powder would still burn! Like cannons, pistols are very inaccurate at more than a few feet and, in the heat of battle, reloading is sloppy at best. Cannons have high odds of success (wide range of dice values) but it's devastating when they miss and they take longer to untie, roll back, clean, reload, roll forward, re-tie, aim, and then fire (thus there are fewer in the deck). Bombs are broadly damaging in their explosion, so luck favours them a bit but not as much as cannons. Knives and pistols could, conceivably, be in good supply and more accessible, but their accuracy stinks, so the odds are lower for success. Now onto more imagination - Davy Jones' Locker and the treason card. That's pretty much pure Caribbean voodoo and in staying with the pirate meme. Davy Jones' Locker is the watery grave a fallen pirate is condemned to but, as in Hollywood movies, there are ways to get those pirates back! But that has a lot of unknowns and needs luck to pull off your evil voodoo ways. The treason card - there are only two in the deck because they can really turn the tide of the game. But I thought they should be there because a pirate might think the riches of the other ship is better. And, honestly, how much loyalty do pirates have? 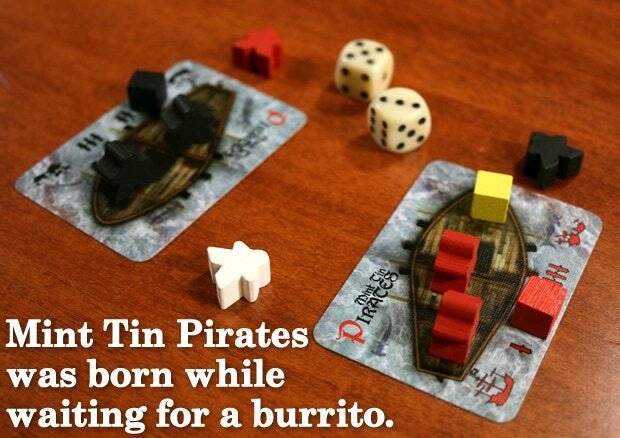 I hope that sheds some light on the attacks and the luck found in Mint Tin Pirates. Now about that gold and the ghost! Brett from our local game design meetup said I needed something for snake eyes and he wanted a kraken to be released! Snake eyes is rare with only a 2.8% chance of being rolled. I did want something special to happen for doubles, for an event that can be seen as good luck smiling down on a band of misfit pirates. What could that luck be? A gold treasure maybe? It adds something to fidget with while playing and does favour the bearer with more resources in the form of an extra card. The pirate ghost is a nod to Scooby Doo! And helps with a potential runaway leader. With such a short play game, a runaway leader isn't a big concern, but that’s a way of addressing it. As a ghost, I first wanted weapons to not have the same effect—after all, it's a ghost! But . . . that would mean complicating the already minimal rules. Since it's paranormal, I took creative license and figured that a two-card handicap would help represent the challenges a ghost might face. And it should truly be a last measure. Oh, another thing about Mint Tin Pirates—the cannon damaging to the ship is a way to keep the game from going too long. The game is balanced to play, most of the time, without needing to reshuffle the deck. But if that's too fast, you can play the sea dog variation that Kate and I sometimes do. This almost always needs the discarded cards to be reshuffled and you play each meeple with two positions. 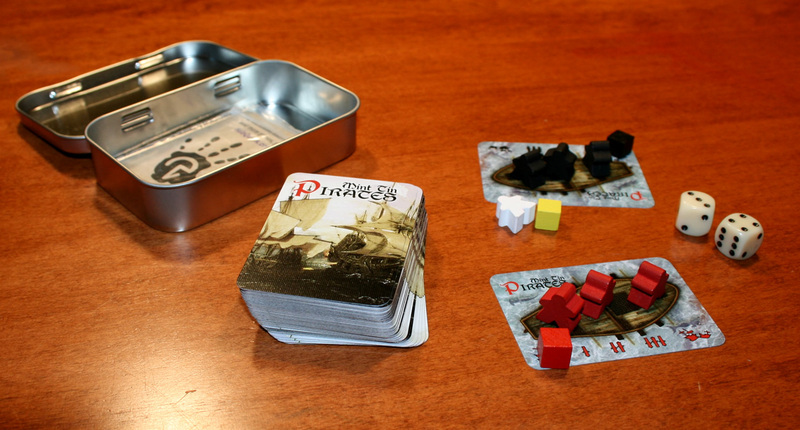 The pirate meeples start in the standing position and lay down when first wounded (the treason card takes a laying down pirate first, if possible). This doubles the numbers of hits you can take. You can also count cannon hits twice by counting down and then back up the damage track. What's next? Mint Tin Pirates: Pizza Party Edition? Maybe . . .
Six player, big hinged tin, an island with treasure, and coves for ship repairs! Form alliances, betray others, and be ye a scurvy dog! All ye scurvy dogs on deck! But rough seas mean that a little luck goes a long way. Cannons do the greatest damage—that is when their powder isn't wet or they don't miss. But cannons take long to load and you'll be able to launch more attacks by tossing hand mortars, throwing dirks, or firing flintlock pistols. But those aren't the only tricks these pirate captains have on deck! Summon a lost pirate from the depths of Davy Jones' Locker or even persuade an enemy pirate to join your crew! And, even in the heat of battle, fate can smile down upon this lowly lot and uncover treasure! No pirate can resist treasure—especially if it contains voodoo that helps them fight! Once you destroy the pirate enemy, you've won! Or have you? Game setup is quick with players choosing a color and a matching galleon card. Each player takes their pirates and places them on their galleon. Place the pirate ghost and the gold treasure between the galleons. Roll the kraken bone dice to see who's first and shuffle the cards well. Deal 5 cards to each player, face down, and prepare to attack! Each player can discard 2 cards at the start of each round to try to make a better hand. 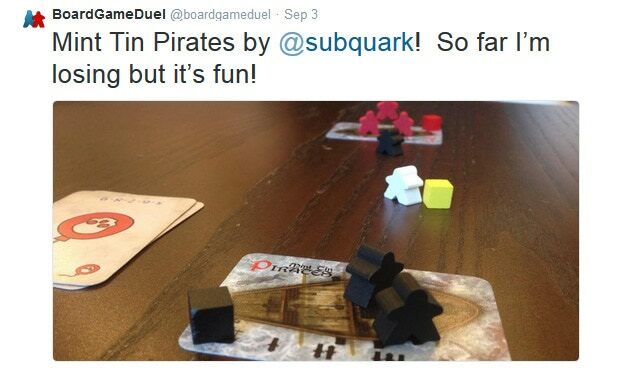 Pairs attack and a gold doubloon acts as a wild card. Cards also tell you how many of that one are in the deck and its chances of success with markings in the top right. When you play a pair, see if your attack is successful by rolling the dice. If your roll's total matches any of the card's bottom numbers, you succeed! A pair of knives claims an enemy pirate that you place at the bottom of the sea next to your galleon. Same for a pair of pistols and hand mortars. Hand mortars have better odds than knives and pistols. A cannon attack is slow but powerful. Odds are that you'll damage their ship and send an enemy pirate to the watery depths of Davy Jones' Locker! A successful cannon takes an opponent’s pirate and also moves their damage counter. Place any pirates you claim to the side of your galleon, laying down. Arrr, 'tis a hard life at sea! Use a gold doubloon to complete a pair, but use it wisely to your best advantage. A pair of Davy Jones' Locker cards can reclaim any lost pirate and place them as part of your fighting crew on your galleon. A pair of treason cards claims an opponent's pirate as one of your own, but this is a rare feat to pull off. Luck isn't only about how accurate your attacks are—rolling doubles claims the gold even if your opponent already snagged it! And gold brings you good fate in the form of an additional card to play with. But . . . lose the gold and you lose the extra card. The first to lose all of their crew, but still be afloat, gets a last chance with the Pirate Ghost! Many a fierce sea battle has been won by the Pirate Ghost, even though it has less resources (play with two less cards), so be ye warned! Be ye a clever pirate captain and read the game's enclosed instructions to get all of the specifics. The first to lose all of their crew, even the Pirate Ghost, loses the battle. Also, if your galleon sinks, you lose! But only this battle has been forsaken—your paths may cross again . . . . If your lunch burrito arrives too soon and the battle isn't over yet, you can still determine who the winner is. Each standing pirate, even the Pirate Ghost, is worth 2 victory points. Each pirate you have claimed is worth 1 victory point. Add a point if you have the gold.